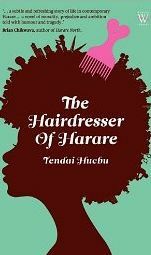 Huchu, Tendai; The Hairdresser of Harare. Harare, Zimbabwe: Weaver Press, 2010. $21.95 (pap), ISBN 978-1779221094. I enjoyed this novel at a number of levels: in the context of Zimbabwean literature, there hasn't been that much humour (apart perhaps from the short stories in Laughing Now) since Dambudzo Marechera and it's encouraging to encounter it here. I also felt it was an interesting fit with Brian Chikwava's Harare North (set in London) in the revealing of the more savage sides of Zim politics and social inequalities through the eyes of an unreliable narrator. And that's the other level -- the perfectly judged ambiguity of tone rendered as an effect of point of view Vimbai starts out comically vain but keenly observant, and a lot of the early humour arises from her observations on the salon, its clients, its owner, the other hairdressers, cumulatively amounting to a microcosm of late Mugabe Zimbabwean society, with its hypocrisies, hierarchies and narcissism. The use of suspense is good too, with Vimbai's gradually unfolding backstory explaining why she lives alone in a large suburban house, why she's fallen out with her family, why she's a single mother, etc. There are plenty of hints even at this stage as to her shallowness and selfishness, but she remains a likeable character with plausible motives. After Dumi moves in with her, the plot thickens and characterisation becomes more complex as Vimbai's relationship with him becomes more ambiguous. Because the reader knows well in advance of Vimbai that Dumi is gay, the dominant tone shifts from comic to ironic. Vimbai's entrancement with Dumi's much richer family and their reception of her spells out the way cronyism and corruption have permeated the society. She appears innocent, but, dazzled by luxury, is she complicit in their buying of her as cover for their son's gayness? In the material conditions of a city where money has no value -- and everyone has to hustle to survive --even if she's aware she's being bribed, can she be blamed? By the time she finds out Dumi is gay, her reaction is clearly rendered as an effect of the social brainwashing which is more clearly dramatised in Harare North. In the latter the persona is one of Mugabe's Green Bombers, and the novel is unsettling partly because he never backs down from the ideology of violence-as-control espoused by the Bombers. At the same time, he is mentally unstable and can't be relied on as a narrator. Vimbai is similarly unreliable in the sense that, while she may suffer at the hands of the elite and is sexually abused by her daughter's father, she fully subscribes to the leadership's designation of gays as 'worse than pigs and dogs'. Her reaction is an effect of the violence and corruption of Zimbabwe's ruined economy, the way poor people take refuge in Pentecostal churches, which similarly preach homophobia, and the need for scapegoats. However, the writer's balancing of comic and serious maintains ambiguity so effectively that even Vimbai's betrayal of Dumi doesn't destroy our sympathy for her. Which is quite a feat!